Healing Sexually Betrayed Men and Boys: Treatment for Sexual Abuse, Assault, and Trauma is the new authoritative source for treatment of sexually victimized men and boys. Male victims and survivors of sexual trauma lived in shadow until the turn of the 21st century, when scandal after scandal about the sexual abuse of boys and men shed light on their suffering. These men and boys require different treatment roadmaps than their female counterparts. Yet there is little in the professional literature to help a clinician work with sexually traumatized boys and men. Richard B. Gartner is a seasoned psychologist/psychoanalyst who has worked therapeutically with sexually abused men for over three decades. He is a clinician, advocate, teacher, lecturer, and nationally and internationally recognized expert on the subject. Dr. Gartner’s classic book, Betrayed as Boys: Psychodynamic Treatment of Sexually Abused Men, is one of the few written to guide clinicians. Now, nearly two decades after writing that groundbreaking volume, he follows up on his earlier work. 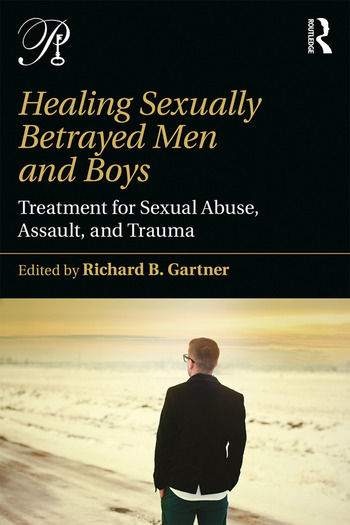 Healing Sexually Abused Men and Boys, together with its companion volume, Understanding the Sexual Betrayal of Boys and Men, is a thorough, comprehensive guide to learning about and healing male victims and survivors. profiling sexual predators and working with survivors who have also been sexual predators. This book is a valuable resource for clinicians at every level of training. With strategies for how survivors can build support networks and descriptions of clinical, familial, and community-based treatments, Healing Sexually Betrayed Men and Boys is essential reading for clinicians of all theoretical persuasions who work with male sexual abuse survivors. Filling in gaps in the relatively scant literature on the subject, it will also help sexually abused or assaulted men themselves understand what is available to them. Richard B. Gartner is Training and Supervising Analyst, Faculty, and Founding Director of the Sexual Abuse Service at the William Alanson White Psychoanalytic Institute; author of Betrayed as Boys: Psychodynamic Treatment of Sexually Abused Men (1999) and Beyond Betrayal: Taking Charge of Your Life after Boyhood Sexual Abuse (2005); and editor of Trauma and Countertrauma, Resilience and Counterresilience: Insights from Psychoanalysts and Trauma Experts (2017) and Memories of Sexual Betrayal: Truth, Fantasy, Repression, and Dissociation (1997) as well as the companion volume to this one, Understanding the Sexual Betrayal of Boys and Men: The Trauma of Sexual Abuse. Co-Founder and Past President of MaleSurvivor.org, he is a pioneer in treating sexually abused men and is quoted widely in the media on the subject.